Image of Isnilon Hapilon used in US government posters. Isnilon Totoni Hapilon (March 10, 1968 – October 16, 2017), also known by the nom de guerre Abu Abdullah al-Filipini ("Abu Abdullah the Filipino"), was a Moro Islamist militant affiliated with ISIS. He was formerly leader of Abu Sayyaf Group, before its battalions pledged their allegiance to Abu Bakr al-Baghdadi. An April 2016 issue of ISIL's weekly newsletter Al Naba said that Hapilon had been appointed as "emir of all Islamic State forces in the Philippines". In the early morning of October 16, 2017, he was killed by the Philippine Army in the Battle of Marawi, along with Omar Maute. According to the Federal Bureau of Investigation and the United States Department of State Rewards for Justice Program, Isnilon Totoni Hapilon was born on March 18, 1966 in Lantawan, Basilan, Philippines. However, his school transcripts indicate his birthdate as March 10, 1968 and his birthplace as Maluso, Basilan. His listed parent/guardian is Haridja Hapilon, a housekeeper. According to the Philippine Daily Inquirer, he had five siblings, and his father was a village imam named Hapilon Totoni. Hapilon started elementary school in 1978, at the age of 10, enrolling at Maluso Central Elementary School. He had a perfect attendance from the first to the fifth grade, but had 28 days of absence and six days of tardiness in his sixth grade claiming that he had to "run errands"; he finished in 1984 with an average grade of 78%. He then enrolled at Basilan National High School, but his transcript ends with his first year even though he was eligible to proceed to second year. In an interview with the Philippine Daily Inquirer, former Lantawan mayor Tahira Ismael, Hapilon's madrasa classmate, claimed that Hapilon "performed poorly in academics". The FBI Most Wanted Terrorists list, and some newspapers including the Philippine Daily Inquirer, The Straits Times, and The Philippine Star, reported that Hapilon earned an engineering degree from the University of the Philippines. On May 31, 2017, the University of the Philippines issued a statement refuting the earlier reports, declaring that they have no record of an alumnus or former student named Isnilon Hapilon. To help identify Hapilon, the US government described his personality as "likable by peers; proud and confident in his abilities" and his physique as "skinny; may have chin hair and slight mustache", being 5 ft. 5 in (1.65 m) to 5 ft. 7 in (1.70 m) tall and weighing around 120 lb (54 kg). According to the FBI, he used a number of aliases including Abu Musab, Sol, Abu Tuan, Esnilon, and Salahuddin. The Rewards for Justice Program lists further aliases including Abubakar Hapilon, Amah Hi Omar, Abu Omar, Abubakar, and Bakkal. He spoke Tausug, Tagalog, Yakan, and Arabic, as well as English. He may have traveled to Saudi Arabia and Malaysia in the past. Hapilon joined the Moro National Liberation Front (MNLF) in 1985 and traveled between Sulu and Basilan. While he was with the rebel group, he took up Arabic and madrasa education again and became the spokesperson of Commander Barahama Sali in 1992. A strong military offensive in 1994 and the death of Commander Sali forced them to flee to Sampinit Complex in Sumisip, where he met Abdurajak Abubakar Janjalani. In June 2002, Hapilon and four other Abu Sayyaf leaders—Khadaffy Janjalani, Hamsiraji Marusi Sali, Aldam Tilao, and Jainal Antel Sali, Jr.—were indicted in absentia by the United States government for their role in the 2000 Dos Palmas kidnappings of seventeen Filipinos and three Americans, and the eventual beheading of one of the Americans, Guillermo Sobero. The August 2000 kidnapping of Jeffrey Schilling, and the deaths of two hostages—American missionary Martin Burnham and Filipino nurse Ediborah Yap—were also cited in the indictment. 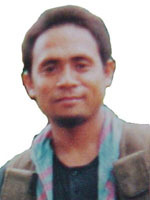 Hapilon was the only one of the five indicted still alive by 2017. On February 24, 2006, he was added to the FBI's Most Wanted Terrorists list, along with Janjalani and Jainal Sali, Jr. The Rewards For Justice Program of the US State Department offered up to US$5 million (approx. 256 million Philippine pesos at the time of his death) for information leading to his capture. In July 2002, Philippine authorities raided Hapilon's suspected hideout in Zamboanga City with the intention of arresting him. However, he managed to escape prior to their arrival. In May 2008, Hapilon was shot in the hand during a military operation in Jolo. His son, Tabari, also an Abu Sayyaf fighter, was fatally wounded. Hapilon was wounded in April 2013, in a military offensive that killed eight other Islamist militants in Tipo-Tipo, Basilan. Hapilon sustained a "slight wound" on the head during the raid, but his followers managed to drag him off safely before the soldiers could seize control of their base. There were United States intelligence reports claiming he may have suffered a stroke at some point. On April 9, 2016, Hapilon and Basilan-based commander Furuji Indama led 100 to 150 Abu Sayyaf fighters on an attack against government forces in Tipo-Tipo, Basilan. At least eighteen soldiers were killed and more than fifty other soldiers were wounded in the ten-hour shootout. Hapilon's son, Ubaida, was among the five Abu Sayyaf fighters killed in the encounter. Additional government forces were deployed to capture or kill Hapilon. A June 21, 2016 video by ISIL entitled "The Solid Structure" recognized Hapilon as the mujahid authorized to lead the jihadists of the Islamic State in the Philippines, and designated him as the emir for Southeast Asia. The video also called on Southeast Asian Islamist militants to travel to the Philippines and engage in jihad. As of January 2017, ISIL acknowledged him as their member. He was known to be in Butig, Lanao del Sur for rectifying the Maute group and joining Abu Sayyaf to establish Islamic State in the Philippines. He was later promoted as emir of the "Philippine Province". In May 2017, during a joint operation of the Armed Forces of the Philippines and the Philippine National Police to capture Hapilon, militants of the Maute group launched an attack in Marawi. As of that time, Hapilon was in Marawi, alongside his supporters. He was believed to be injured. In October 16, Isnilon and Omar Maute were killed in a military operation in Marawi, which rescued 17 hostages. The deaths were confirmed by Defense Secretary Delfin Lorenzana. Lorenzana announced on October 21 that the FBI confirmed that the DNA sample of a body recovered by AFP matched that of Hapilon. This was confirmed by Lamont Siller, the FBI's legal attaché at the Embassy of the United States, Manila as well as the embassy's spokeswoman Molly Koscina. ^ Nur Misuari, leader of the MNLF, signed a peace agreement with the Philippine government in 1996. Abdurajik Abubakar Janjalani, a former MNLF fighter, recruited other disappointed radical MNLF members to form the Abu Sayyaf, which aims to establish an independent Islamic state instead of an autonomous region. ^ Abu Sayyaf used to be affiliated with al-Qaeda: Abu Sayyaf founder Abdurajak Abubakar Janjalani met Osama bin Laden, the founder of al-Qaeda, during the Soviet–Afghan War (1979–89). Abu Sayyaf was then funded by al-Qaeda through Mohammad Jamal Khalifa, a brother-in-law to bin Laden. ISIS, another militant group, was affiliated with al-Qaeda from October 2004 to February 2014, when al-Qaeda publicly disavowed any relations with ISIS after an eight-month power struggle. Other armed Islamist groups previously affiliated with al-Qaeda, including the Abu Sayyaf, eventually pledged allegiance to ISIS. This resulted in ISIS becoming more powerful than al-Qaeda. ^ a b c d Fonbuena, Carmela (June 1, 2017). "What ISIS follower Isnilon Hapilon's transcripts reveal about his childhood". Rappler. Retrieved June 27, 2017. ^ Moubayed, Sami (February 12, 2017). "The Philippines: a new source of grass roots for ISIS?". Asia Times. Retrieved July 12, 2017. ^ a b Ness, Marielle (June 15, 2017). "Beyond the caliphate: Islamic state activity outside the group's defined wilayat: Southeast Asia" (PDF). United States Military Academy, West Point, New York, U.S.: Combating Terrorism Center. United States Military Academy. Retrieved July 12, 2017. ^ "Abu Sayyaf rebels pledge allegiance to ISIS". manilatimes.net. January 11, 2016. Retrieved October 15, 2017. ^ "Islamic State details activity in the Philippines". The Long War Journal. Retrieved October 15, 2017. ^ a b c "Isnilon Hapilon". rewardsforjustice.net. Rewards for Justice. Retrieved June 27, 2017. ^ a b c d e f "ISNILON TOTONI HAPILON". fbi.gov. Federal Bureau of Investigation. Retrieved June 27, 2017. ^ a b c d e Alipala, Julie (June 1, 2017). "FBI called out on fake Hapilon news". Philippine Daily Inquirer. Retrieved July 10, 2017. ^ a b Dancel, Raul (May 25, 2017). "Abu Sayyaf chieftain Isnilon Hapilon: Engineering grad now one of world's most wanted terrorists". The Straits Times. Singapore Press Holdings. Retrieved June 27, 2017. ^ Alipala, Julie (May 26, 2017). "Hunt for Abu Sayyaf chief leads to Marawi battle". Philippine Daily Inquirer. Retrieved July 11, 2017. ^ a b c d "Who is Philippines' most wanted militant Isnilon Hapilon?". The Philippine Star. May 25, 2017. Retrieved June 27, 2017. ^ De Jesus, Julliane Love (May 31, 2017). "Abu Sayyaf chief Isnilon Hapilon not a UP graduate". Philippine Daily Inquirer. Retrieved June 27, 2017. ^ "Isnilon Hapilon not a graduate of UP, admin clarifies". GMA News. June 1, 2017. Retrieved June 27, 2017. ^ Gita, Ruth Abbey (July 5, 2017). "2 Vietnamese captives found dead in Basilan". Sun.Star. Retrieved July 10, 2017. ^ "Chronology for Moros in the Philippines". refworld.org. Minorities at Risk Project. 2004. Retrieved July 12, 2017. ^ "Abu Sayyaf Group". stanford.edu. Stanford University: Mapping Militants Project. July 20, 2015. Retrieved July 12, 2017. ^ "Timeline of the Abu Sayyaf in the Philippines". Agence France-Presse. April 9, 2016. Retrieved July 11, 2017. ^ "U.S. Charges Abu Sayyaf Members in Missionary's Death". PBS. July 23, 2002. Retrieved July 12, 2017. ^ Brush, Pete (June 28, 2002). "U.S. Indicts Abu Sayyaf Members". CBS. Retrieved July 12, 2017. ^ "U.S. charges Abu Sayyaf leaders in kidnappings". CNN. July 24, 2002. Retrieved July 12, 2017. ^ a b Reward offer Archived 2007-06-08 at the Wayback Machine on five ASG members, Rewards for Justice Program, US Department of State; accessed October 16, 2017. ^ FBI Updates Most Wanted Terrorists and Seeking Information – War on Terrorism Lists Archived 2010-08-30 at the Wayback Machine, FBI national Press Release, February 24, 2006. ^ PareÃ±o, Roel (July 29, 2002). "Sayyaf leader Hapilon eludes arrest in Zamboanga". The Philippine Star. Retrieved July 12, 2017. ^ Wee, Darwin (May 2, 2008). "Abu Sayyaf leader wounded in battle". GMA News. Retrieved July 11, 2017. ^ "Abu Sayyaf leader wounded, son killed in Philippine offensive". Australian Broadcasting Corporation. May 1, 2008. Retrieved July 11, 2017. ^ Mogato, Manuel (April 16, 2013). "Top Filipino militant wounded in army attack". Reuters. Retrieved July 10, 2017. ^ Calonzo, Andreo (April 16, 2013). "Army officer: Abu Sayyaf leader Hapilon hurt in Basilan clash". GMA News. Retrieved July 10, 2017. ^ Wilson, Karl (February 26, 2010). "Abu Sayyaf continues to pull numbers to resistance". The National. Abu Dhabi Media. Retrieved July 10, 2017. ^ James, Michael; Cooley, John (December 20, 2001). "The Abu Sayyaf-Al Qaeda Connection". ABC News. Retrieved July 12, 2017. ^ Sly, Liz (February 3, 2014). "Al-Qaeda disavows any ties with radical Islamist ISIS group in Syria, Iraq". The Washington Post. Retrieved July 12, 2017. ^ Mohammed, Riyadh (November 16, 2014). "SIS Beheads Another American as 60 New Terror Groups Join". The Fiscal Times. Retrieved July 12, 2017. ^ Rogers, Mike (November 25, 2015). "ISIS may be more dangerous than al Qaeda". CNN. Retrieved July 12, 2017. ^ Ressa, Maria (October 15, 2014). "Senior Abu Sayyaf leader swears oath to ISIS". Rappler. Retrieved July 12, 2017. ^ "Philippine militants pledge allegiance to ISIS". The Daily Star. August 15, 2014. Retrieved July 12, 2017. ^ Cahiles, Gerg; Jocson, Liza (April 10, 2016). "18 soldiers dead, 5 Abu Sayyaf bandits killed in Basilan encounter". CNN Philippines. Retrieved July 12, 2017. ^ Santos, Eimor (July 9, 2016). "Wesmincom: Sporadic firefight ongoing in Basilan". CNN Philippines. Retrieved July 12, 2017. ^ "Over 100 ASG bandits fought in Basilan clash". Manila: Philippine Daily Inquirer. April 10, 2016. Retrieved July 12, 2017. ^ Buan, Lian (June 13, 2017). "Calida: Military knew Marawi terror plot as early as April". Manila: Rappler. Retrieved July 12, 2017. ^ "Winning the war with IS in the Philippines, but losing the peace". The Economist. July 20, 2017. Retrieved July 22, 2017. ^ Viray, Patricia Lourdes (October 16, 2017). "Isnilon Hapilon, Omar Maute confirmed killed in Marawi". Philstar.com. Retrieved October 16, 2017. ^ Aben, Ellie Lourdes (October 21, 2017). "FBI confirms death of Isnilon Hapilon in Marawi". Arab News. Retrieved October 21, 2017. ^ "Marawi: DNA test confirms death of Isnilon Hapilon, one of FBI's most wanted terror suspects". Associated Press. ABC News. October 22, 2017. Retrieved October 22, 2017.